Different opponent, same result. The No. 8 Quinnipiac men’s ice hockey team (14-2, 7-2 in ECAC Hockey) may have been the underdogs if you looked at the national rankings, but that did not stop them from coming away with 4-0 victory over the No. 1 ranked UMass Minutemen (12-2, 7-0 in Hockey East) on Friday night. A packed Frank Perrotti Jr Arena did not take long to erupt in this one, as winger Wyatt Bongiovanni got the Bobcats out to a 1-0 lead 42 seconds into the game. The freshman found and buried a rebound out front, and Chase Priskie picked up the assist with a shot from the point. The Bobcats tailed off a bit in the second period by not generating as much offense and having to spend more time in the defensive zone than they probably would have liked. 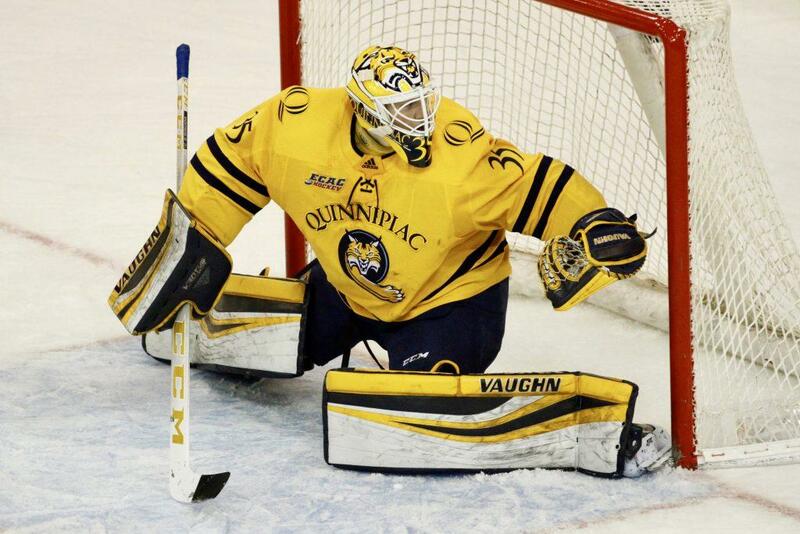 However, the play of netminder Andrew Shortridge was vital to Quinnipiac coming out of the second period unscathed. The Anchorage, Alaska native pitched his third shutout of the season with 32 saves, with a couple being highlight-reel ones as well. Despite a slow start to the second, Quinnipiac was still able to extend its lead to 2-0 with 7:04 left in the period. A team’s fourth line is typically put on the ice to provide high energy and a boost to the rest of the bench, and they were able to do that and then some. After an offensive zone face-off sent to puck to the corner, big-bodied winger Joe O’Connor won the 50-50 puck, finding freshman Zach Metsa with a beautiful one-time pass that found its way to the back of the net. Head coach Rand Pecknold was pleased with the play of this line in the win. Senior Craig Martin had a key impact in this game too. The senior gave added insurance to the Bobcats in the third period with two goals – his second two-goal performance in as many games. The veteran plays a sound 200-foot game, and has been rewarded lately on the score sheet. While the Bobcats will sit back and enjoy this win for a short moment, they still have business to take care of tomorrow. UMass head coach Greg Carvel was certainly not in good spirits after the game, but knows the weekend is not over. It is certainly a quick turnaround for both of these teams, as the Mullins Center in Amherst will host Quinnipiac tomorrow night at 7:30 p.m. While they responded well to a vibrant crowd in Hamden, it would be nothing short of impressive for the team to come away with a win in what should be a very electric UMass building.